Upgrading my speaker cabinet/combo amp. 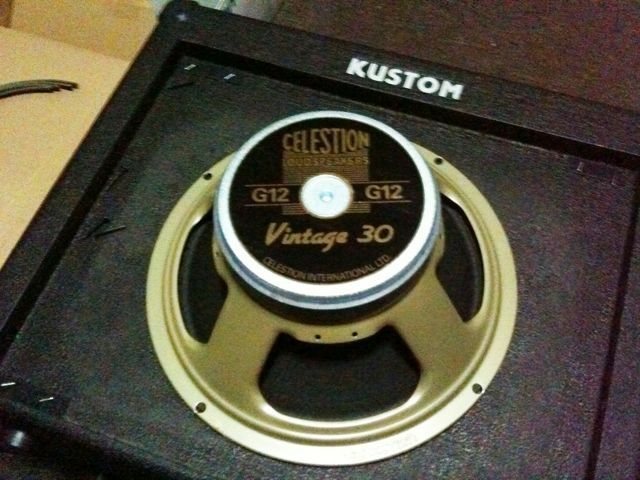 After waiting over seven months for it to arrive, my Celestion G12 Vintage 30 is finally here! I decided after getting my Blackstar HT-5 head last year that I needed to upgrade the speaker that was in my cabinet (Kustom KGA65 combo amp) to something that provided some more mid-end grunt as well as clarity. The speaker that came with my KGA65 was a Celestion Super 65. It was by no means a terrible speaker, but it made the Blackstar sound a little too dark and muddy. I decided that I needed a speaker that would add a nice mid-range sound, as well as tighten up the bass response. I will be writing a review on the Vintage 30 soon.